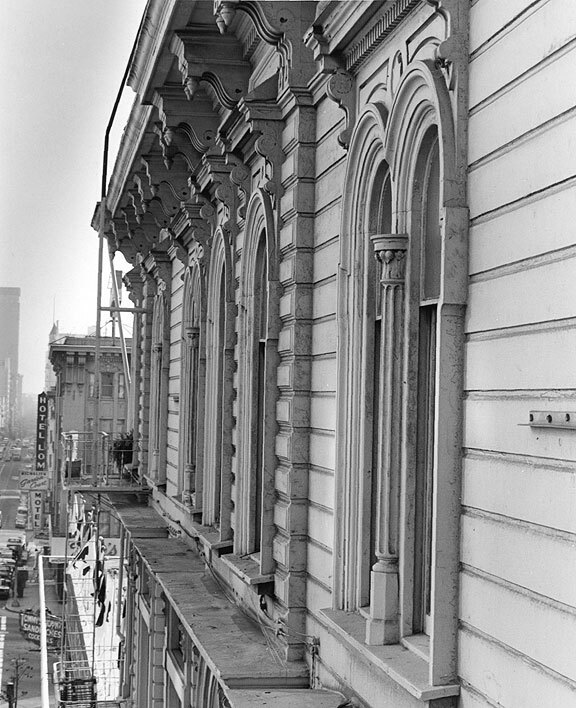 This is a poetic description of the artists' commune that saved the historic Goodman building from destruction at the hands of San Francisco's Redevelopment Agency. The artists listened to the owner of the building's, Melvin Goodman, pleas for help to stop the destruction of the building which his family had built nearly a century before. The artists struggled creatively to use the law and public opinion to stop the destruction and by their efforts it stands today. 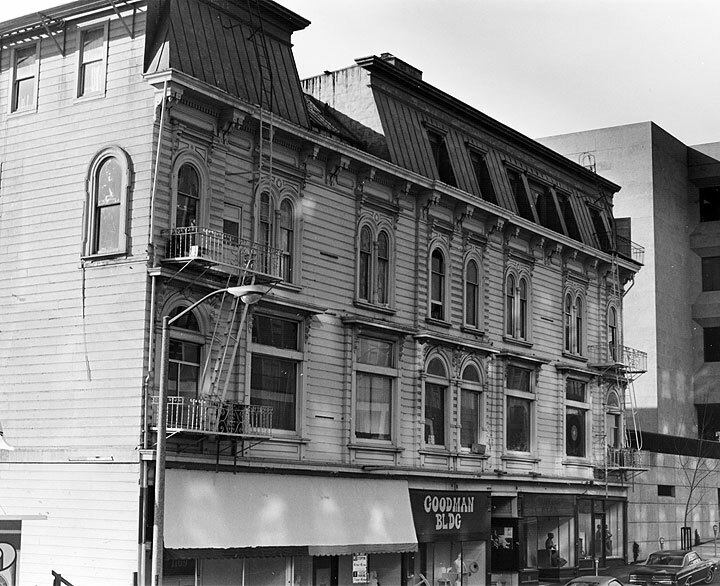 Original Goodman Building on Geary between Franklin and Van Ness. View east on Geary along front of Goodman Building. This labyrinthian and mysterious character came partly from the Goodman's original design, but even more as the result of the many remodelings that had been done to accommodate its changing history of use. 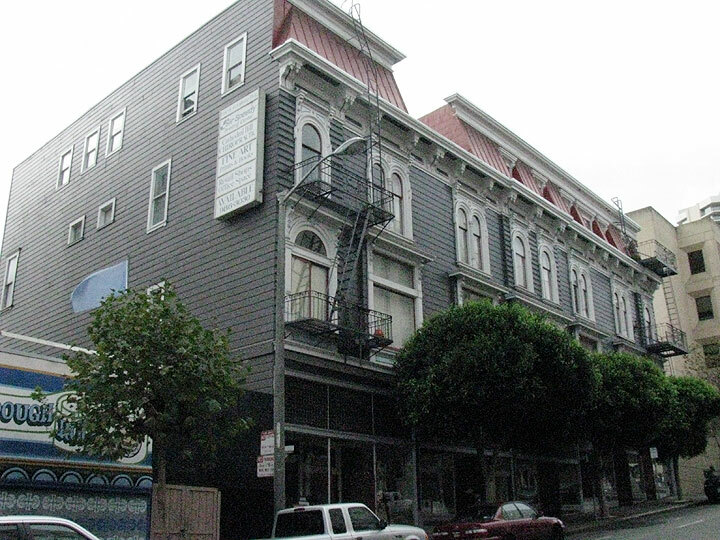 Originally built in 1869 as twin Victorian townhouses, it had survived the earthquake and, because of the housing shortage that followed, was remodeled into a residential hotel, interspersed with offices. 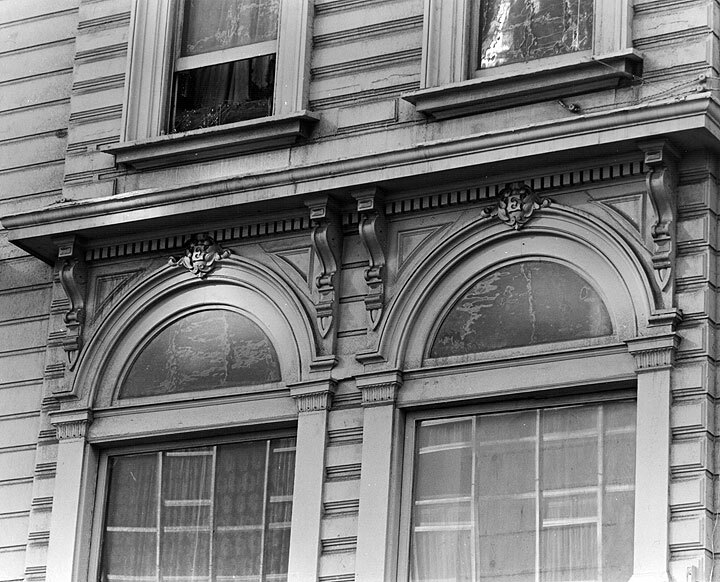 What had once been a top floor ballroom was converted to a photographer's studio with a spectacular La Boheme skylight. Then, around 1904, the whole thing was raised up and five storefronts added at the ground floor. Gold was rumored to be hidden in the stairway newel posts and we would hunt for it at parties. A skeleton was reported to be buried under the fallen, defunct elevator. And the ghost of the first owner's wife was said to walk the top floor late at night. 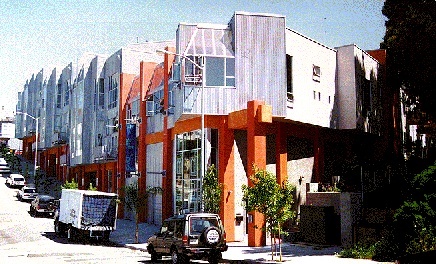 By the time of our eviction in 1983 when the building was given over to a hugely wasteful development that took five million dollars in what little was then left of Section 8 subsidies to convert a lean and lively congregate use structure into an overblown, inert structure replete with individual baths and kitchens to meet HUD codes and reap huge profits for the developer who cashed in on our preservation efforts and attendant tax write-offs--a lot of consciousness had been raised and our ideas validated, even though we lost the building.